Penujak village is not more famous from other village such as Sembalun village or other pottery centre such as Banyumulek. But this village is the oldest pottery centre in Lombok island. 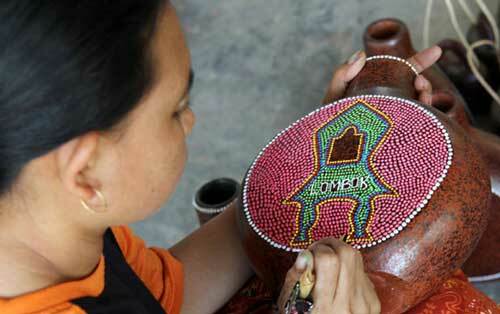 And from this village, the Lombok pottery handicrafts spread to other regions in Lombok. 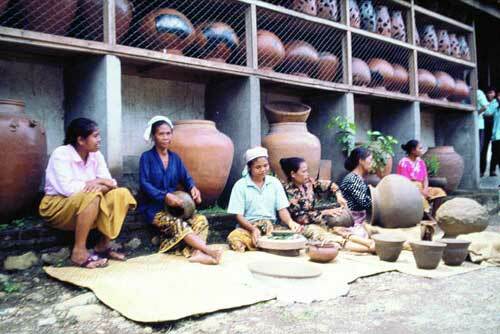 For Penujak lombok people, pottery has cultural relation and a noble philosophy value. According to a senior pottery craftsman, the Lombok handicraft was begin from a simple kettle which used for Adat Urip ceremony (a life ceremony), and Adat Pati ceremony (a death ceremony). After a birth of a baby, the kettle is used to keep the placenta. In daily life, kettle is used to cook and to other needs. When death coming, kettle is used to clean up the dead body. This value that should be minded by people so they won’t be arrogant, because mankind are made from one lump of ground only, and will be back to the ground and completely depend to a simple kettle made from ground. Almost 70% of Penujak lombok people are working as a pottery craftsman, and they are spread in 7 small villages with distance amongs each craftsman around 600 m. each small villages has their own favorite stuff, such as Adong small village with its earthen pot, Tongkek village with its candle place, Toro and Mantung with their plate, and Terandon village with its kettle. While Telage village tends to do the finishing and decorating the pottery. 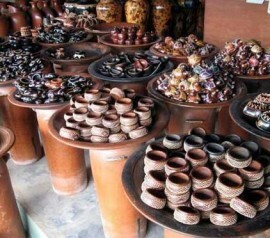 In Penujak village, you can see almost all the pottery processes, starts from the forming, the burning, till finishing. All of them are done traditionally without machine. The pottery productions from Penujak village are sold in various prices starts from IDR 5,000 till IDR 200,000. Besides having ordinary shape, there is one unique product that becomes craftsman favorite, which called thief kettle. This pitcher with medium size is unique because the water is put from the bottom part of the kettle and the water won’t fall down if the kettle is put. This kind of Lombok handicraft can be found in art shops in Penujak village, or you may order it straightly from the craftsman with the same motif with price around IDR 30,000/pc. 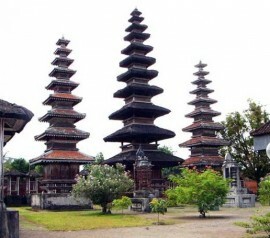 You should visit and shop in this place when holiday in lombok. You don’t need to worry about the quality since Lombok pottery from Penujak village has the best quality in Lombok island and has been worldly admitted. The soil that is used is included into the best soil, and the leakage percentage is below 15% according to New Zealand project in 1980-1983, so it makes the best quality pottery product. 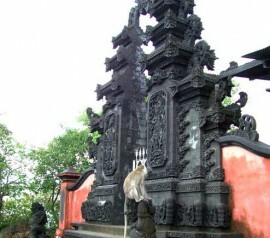 Penujak village is about 35 km from Mataram centre or 2 km from Lombok International Airport /BIL. 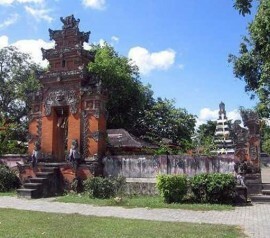 With personal car, this village can be reached in 50 minutes from Mataram city. You may take main road to BIL, head your car to the east till Sengkol three junctions. Then turn to right. 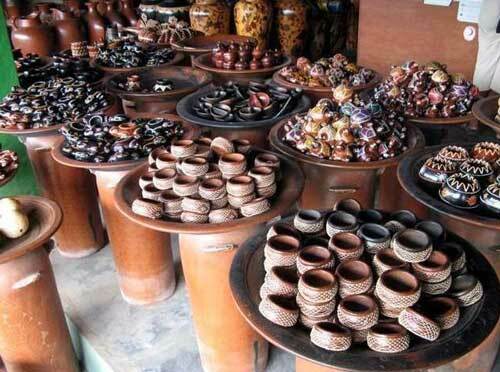 After 15 km from the three junctions, you will found pottery centre called Penujak village. Also mentioned: penujak, penujak pottery work lombok, lombok pottery. Craftswomen that are working usually accompanied by their children. If you want to give something to the children, don’t give it in the form of money. If you want to see the making of pottery from the beginning to finishing process, come at 08.00-10.00 am. 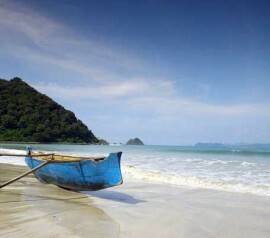 Location: West Praya sub district, Central Lombok Regency. Public Facilities: art shops, and soil-made accessories shops.